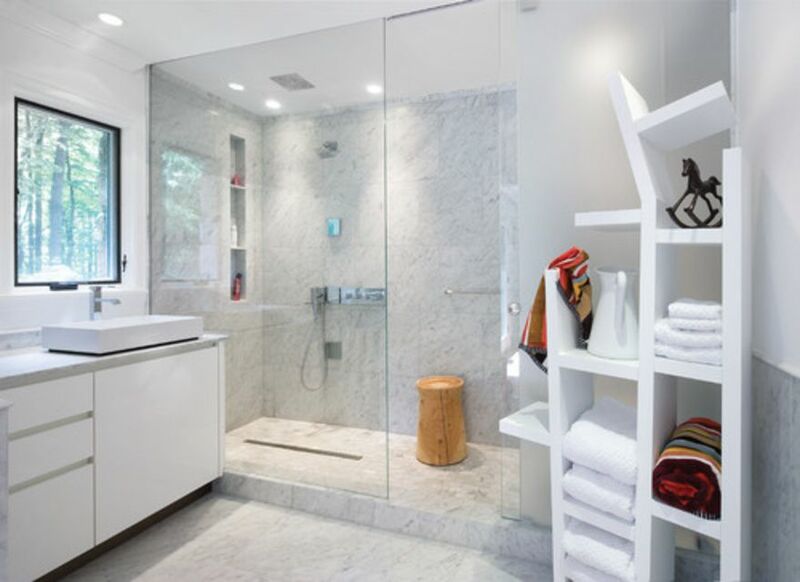 White marble is a fantastic material for bathrooms. This beautiful stone is naturally water-resistant and adds a luxurious, elegant feel to any space. Marble has been used for construction for millennia; the Romans had public baths made of it! Marble is appropriate for many decor styles: contemporary (as in this gorgeous family bathroom by Poliform), traditional, modern, classic, and many more. Using marble in the bathroom has two important caveats: you need to seal it, and you need to watch out for slip-resistance. A lot of marble finishes have low slip-resistance, which makes them dangerous in potentially wet spaces like bathrooms. To counter this problem, use a finish with higher slip-resistance, or add rugs in high-traffic areas. "Soft modern" is a term used to describe many of today's "typical" bathrooms. It features mostly modern shapes, with some traditional features, and is a comfortable, recognizable style. This large basement bathroom by Dean Poritzky Custom Homes features white marble as the main material, with brushed nickel hardware that highlights the gray marbling of the stone. Yes, this is actually marble: marmara marble, to be exact. This marble from Turkey features linear veins, which gives it a look that is quite distinct from your garden variety marble. In this beach bathroom by William Guidero Planning & Design, the horizontal installation recalls lines in the sand. This master bathroom by Mia Rao Design with double vanity features shiny white marble on the floor and walls, with an interesting contrasting wall in black. Since the white gives off an impression of a very large space, you can afford to add a dark wall for visual interest. It still remains monochromatic, which is very modern. A clever mixing of white marble mosaic tile, white marble countertop, and white and gray leaf wallpaper gives this beautiful bathroom by Jennifer Worts Design a peaceful sense of harmony. Get a change from the "typical" marble floor by using small tiles rather than large squares. Here's one thing about white marble: it can sometimes look a little cold. But it's easy to add a little warmth with some organic textures and colors. This contemporary bathroom by OnSite Studios features a lot of white marble, contrasted with a natural wood shower floor. This makes the whole much more welcoming and warm. Dreamy! This modern bathroom by Anne Hepfer Designs uses a hex tile to showcase the most interesting marble veining, as well as a wall treatment that reminds you of a lightly clouded summer sky. The mix of metal, stone, and glass is beautifully harmonious. This traditional, modernized Victorian design by Michael Smith Architects uses a large freestanding tub with side faucet set on a white marble tile floor with a contrasting taupe and marble mosaic in the middle. The same taupe is reproduced on the walls for a neutral accent that keeps the space open, warm, and classic. Marble doesn't just come in white: it also comes in black. This bathroom, by Caden Design Group, uses a diamond-tiled white marble tile for the floor, but contrasts it with a night-dark black marble countertop. A little black is all you need to break the monotony of the otherwise all-white design of this space. Since marble is white with a touch of gray, almost any color will do as an accent. A particularly glamorous choice is gold, and it works perfectly in this contemporary bathroom by Joe Carrick Design. The angled bathtub and the brushed gold accessories give this space lots of personality. If you really like white marble, then this contemporary-style bathroom by Kristie Michelini Interiors will fit the bill just right. Thankfully, tiles of different sizes break a potentially monotonous design, along with a lot of big veining to bring movement. 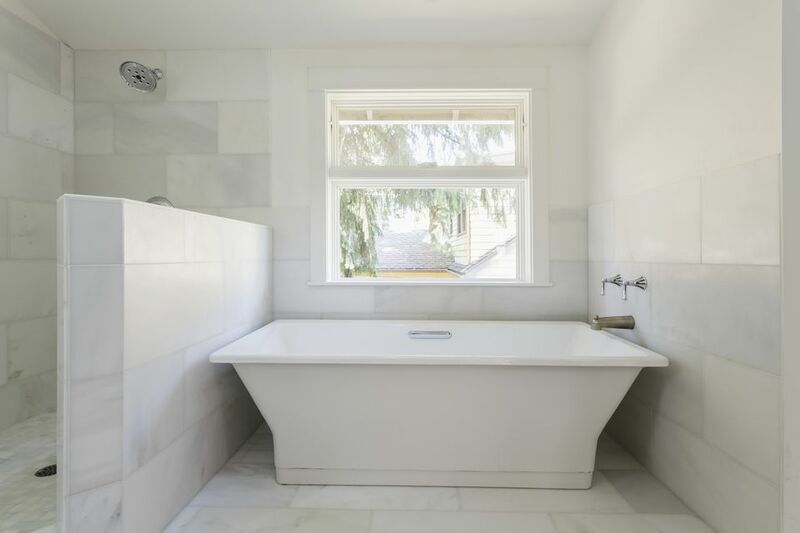 A skylight set directly above the large freestanding tub provides lots of light. If you can afford its cost, a large slab of marble can look absolutely beautiful. This transitional bathroom by Legacy Custom Homes uses large, uncut slabs on the sides of the tub, and decorative (but barely noticeable) tiling on the floor. The natural, uninterrupted veining brings out the best in the marble. Marble appears in different forms in this master bathroom by RLH Studio. The tub and countertops are examples of classic uses, but note the 50s-style "woven" tile made with a combination of marble and black stone. This mosaic tile brings movement and fun and serves as an interesting contrast to the more organic flower wallpaper. In this contemporary bathroom by Katch I.D., large marble tiles are put together to maintain the natural veining of the stone. A shallow freestanding tub gives the space profile and interest without taking all of the visual attention. The tub is balanced by the casually settled artwork, which also recalls the colors of the vanity stool. This bright marble shower by Veronica Martin Design Studio would make any feel fresh every morning. Different sizes of tiles give the space a little movement and interest, while a minimal rain shower head and hardware keep the eyes on the stone, not the faucets. Marble isn't just for large, palatial bathrooms. Smaller spaces can also benefit from a touch of marble luxury. This modern bathroom by Tamara Magel cleverly uses an affordable marble herringbone tile to spruce up this smaller space. The small but practical vanity features a wide sink set in a marble countertop, as well as a faucet with clean, modern lines. Can You Realistically Remodel a Bathroom in 23 Days?